So the weather had warmed up Sunday morning and I was thinking of taking Terra Nova out for a ride of some kind. I took delivery of her on Sept. 9 and through a series of events too tedious to relate here, she had only 475 miles on the odometer. I wanted to get her over the 600-mile mark and in for the first necessary maintenance. New motorcycles have to be painstakingly broken in to avoid engine damage. 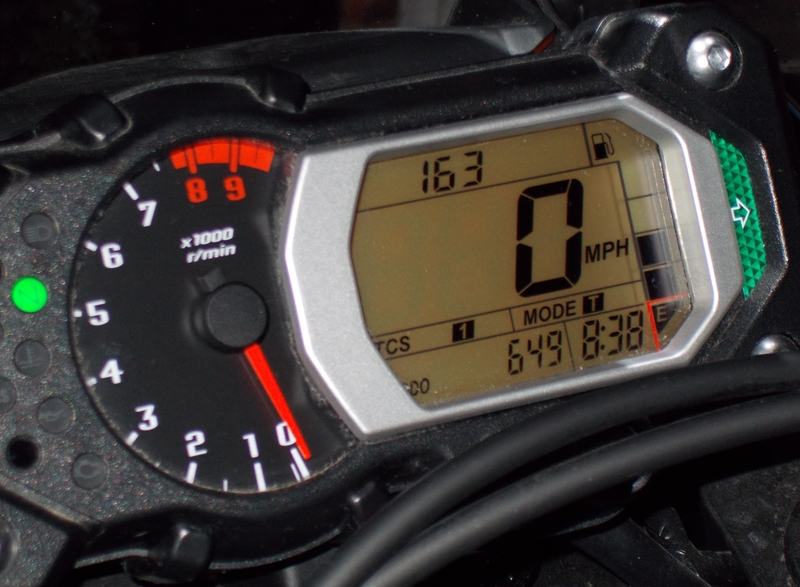 It varies by manufacturer, but the first 600 miles are usually the most critical. You have to put those miles on carefully, taking heed not to run the engine above 4,000 rpm. At the 600-mile mark, you (or your dealer/mechanic) change the engine oil and filter, the final drive lubricant and make some other adjustments. I put on those 475 miles as I should. I took the additional precaution of changing the engine oil and filter and the final drive oil at the 110-mile mark, just to be safe. Now, all I needed was those extra miles. Waiting for Linda to get home from church, I threw a video in the DVD player – One Crazy Ride, by Gaurav Jani, an independent filmmaker in India and a true motorcycle traveler. A brief aside is necessary: I became a big fan of Mr. Jani after seeing this film and his earlier documentary, Riding Solo to the Top of the World. I’m fascinated by motorcycle travel and I really liked the two Ewan McGregor and Charley Boorman films, Long Way Round in 2004 and Long Way Down in 2007. The two actors had a substantial back-up crew and cameramen to film those rides. Both are interesting and very well done. Mr. Jani, however, is far superior. In Riding Solo to the Top of the World, he’s a one-man film crew documenting his own ride in 2005 from Mumbai to the Changthang Plateau in Ladakh, India, near the Chinese border. He rides through incredible cold, desolate but beautiful landscapes, and oxygen-starved mountain air to meet and learn about the reclusive people of the plateau. It’s an incredible work of filmmaking. And his third film, Motorcycle Chang pa, is due out soon. 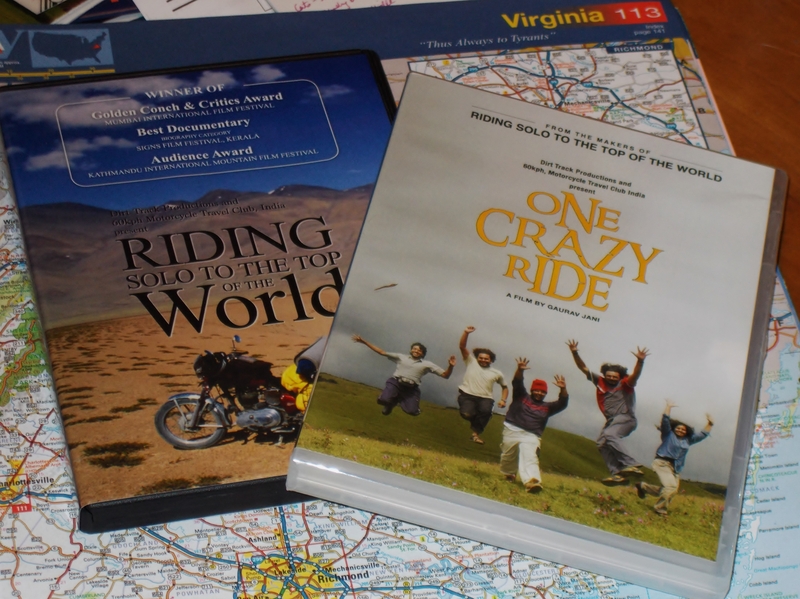 One Crazy Ride, the one in my DVD this morning, is a movie about a 2008 motorcycle ride Mr. Jani and four friends took from Mumbai to a remote part of northeast India. One could sum it up this way: friendship, hardship and awesome scenery. This, too, is an exceptional film. I ended up giving a copy to Gopal Ratnam, one of the defense analysts at work, when some of us were trying to coax him to give in to his desire to get a motorcycle. Gopal looked over the DVD and said he thought he knew Mr. Jani. I ended up buying a second copy. So the replacement DVD is on while I’m fussing with the bike, getting it ready for our own little ride in our corner of the world. Linda gets home, we suit up and take off. There’s no real destination in mind, other than maybe Orange, Virginia, an antique-y type of small town we’d visited once before. Twenty-five miles out, we stop for fuel at a 7-11 station on U.S. 29 in Gainesville, Virginia. Linda gets a soda while I grab a can of Red Bull. The cashier is a friendly guy, from southern India, as it turns out, and he’s curious about the motorcycle and asks where we’re from. “In my country,” he says, “a lot of people don’t like motorcycles. They are everywhere, they’re all that most people can afford for transportation. So they are everywhere in the streets.” Many consider them a necessary nuisance, he says. I enthusiastically tell him about watching One Crazy Ride that morning, but, dang it, I can’t remember the filmmaker’s name. But the cashier is familiar with the region they visited. We gather up everything and leave, and he wishes us safe travels. Instead of getting back on the bike, we finish our drinks and I dig out a pen and part of a notecard and write down the film’s name and Dirt Track Productions, the movie company, intending to give it to the guy and ask his name. When I go back in the store, he’s in the restroom, but a co-worker says he’ll give him the card. So I didn’t get to know his name. The rest of the ride goes smoothly; we make it down to Madison, Virginia, then turn around and head home, stopping for dinner at a chain restaurant. 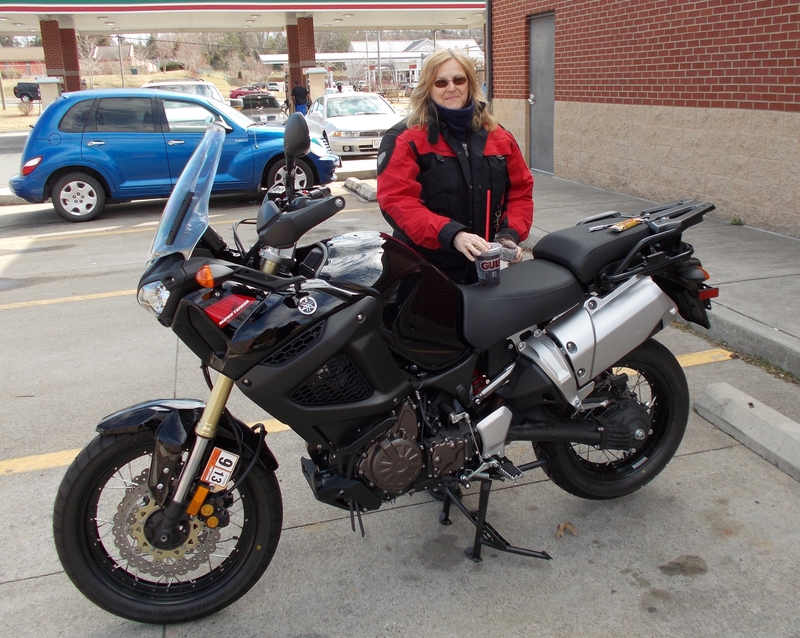 It was a little chilly, but all in all, a good day, a decent ride, and Terra Nova now has 649 miles on the clock. And I hope my friend at the 7-11 gets to see those movies.